Folder Lock is security app that helps protect important work saved in files and folders on Windows 10 desktops and laptops. Folder Lock for Windows is packed with features that will address all your data privacy and protection needs. Now protect files, folders and system drives with encrypted passwords so that no unauthorized person can gain access to personal information of any kind. With Folder Lock for PC you can backup files in seconds and is compatible with Windows 10/8/8.1/7/Vista & XP. In this post we will show you how to Download Folder Lock Windows 10 app loaded with plenty of options to keep data private and out of hackers’ reach. You can shred files, drives and history so that it doesn’t fall into wrong hands with Windows 10 Folder Lock app. After downloading and installing this application you won’t be required to buy any extra security app on PC/laptops because it possesses all vital security feature that one could wish for in a data security and backup app. 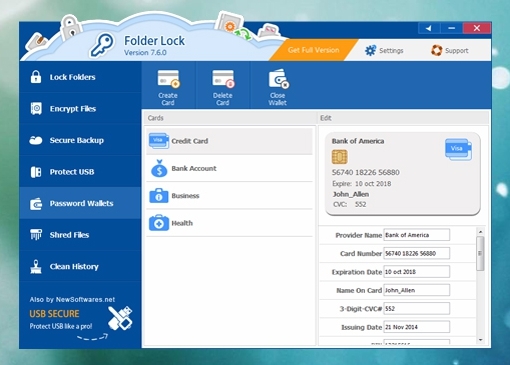 Folder Lock app after installation automatically integrates with Windows Explorer making file locking just a click away, simply find a file to lock and right-click on it to lock it from by choosing lock option from the drop-down menu. You can either choose to lock or shred files, folders or drives. Similarly, you can password protect files; encrypt files & emails and protect USB & DVDs by just click and choosing the lock or shred option. Ability to lock, hide and protect images, documents, videos with simple mouse click. Save all bank and other financial information in encrypted files and folders. Protect credit and debit card details, addresses and banking transactions details with industry leading AES 256-bit encryption standard on digital wallets. Shred files to permanently delete them making it hard for even file recovery software program to restore it. Cloud Storage backup option to save and retrieve file from anywhere and any device. It has more features than many other similar file protection apps around to ensure all corners of data protection are covered. Both free and lite version expire after trial period but with paid version you can have complete protection throughout the year at reasonable price check here for details. How to block Pop-Ups in Microsoft Edge Browser Manually.